Russia has always been defined in fundamental ways by its forests. Over the centuries, the vast northern forests have provide shelter and refuge, sustenance, wealth and spiritual inspiration. Pine and fir have been the most common material, with aspen and birch for secondary details. In Russia, the great ancient oak forests have largely disappeared, but medieval chronicles refer to major oak structures built by the eastern Slavs, predecessors of today’s Russians. Although many common features unite them, each region of Russia in the forest zone (including Siberia) has its distinctive traditional forms of wooden architecture. And today many regions have created outdoor museums that attempt to preserve or recreate the remnants of this heritage. The northwestern part of Russia is especially rich in these museums, just as the north still has a large percentage of the surviving wooden monuments. One of the newest of these museums is located at the village of Semyonkovo, a few miles to the northeast of Vologda, one of the major centers of the Russian north. The city of Vologda itself has many surviving wooden structures of a distinctly urban character but the Vologda region also has many towns and villages with rich traditions of vernacular architecture associated with a free peasantry. To preserve and propagate this heritage, the Semyonkovo open-air museum was opened in 1992. The design of the Semyonkovo ensemble is intended to suggest the plan of a northern village, although the impression created by the assembly of so many distinctive examples is different from the experience of being in a northern village. The buildings here are for the most part from the Tarnoga and Niuksenitsa areas in the north-central part of the Vologda territory. 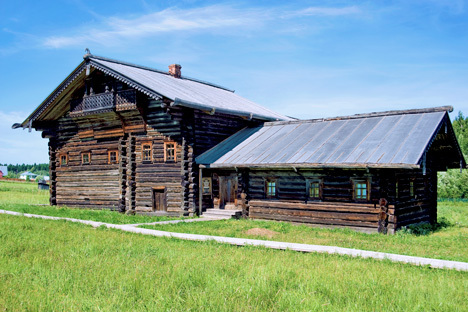 Among the remarkable examples of northern log dwellings gathered at Semyonkovo, one of the most interesting is the late 19th-century Bolotova house, brought from the village of Korolevskaya in the Niuksenitsa Region. In harmony with climatic conditions that required the bringing together of the farmstead into one protected unit during the long winter, this complex structure includes not only the main living space and a smaller dwelling attached to the side for a new branch of the family, but also a barn, attached to the back, for storage and livestock. Although some of the houses at Semyonkovo are more modest than others in dimensions and plan, each reveals some variation on this concept. At Semyonkovo, a number of the house interiors have been preserved or recreated in the traditional manner. Each interior has a main room with a large brick stove for cooking as well as to heat the house in this severe climate. (In many rural parts of Russia this tradition of the central stove survives with little change.) It was in this space that the extended family would gather during the long winters. Larger houses would have a separate bedroom for the head of the household and his wife. Since most of these large families also contained a young couple, a separate space would be created for them, sometimes in the back of the house, sometimes in a loft. And in the largest houses, a separate space for use in the summer would be created above the main floor. Large barns occupied the other, back part of the structure. The barns were often on two levels, with the lower for animals and the upper for hay and other storage. A number of these spaces have been converted to house museum displays on local culture, but the general outlines of structure remain clearly visible. Between the two parts of the house was a corridor, which provided further insulation for the heated dwelling space in the front. The museum complex also contains examples of small separate barns and sheds. The dominant architectural monument at Semyonkovo is the recently rebuilt Church of St. George from the village of Potskii Pogost in the Tarnoga area. A series of mishaps beginning in the late 1980s prevented the church from being preserved in its original form, but it was measured in detail and photographed during prolonged preservation efforts. The reconstructed church is an accurate reflection of the original, with a design characteristic of large log churches of the Russian north. The square base structure has an elevated entrance (above the snow level in winter), which is accessed by a covered stairway. The main worship space has a ceiling to preserve warmth and to create a sense of a house of worship, yet the main part also supports an extended octagonal structure that in its turn provides a platform for a soaring "tent" tower—one of the distinctive forms of northern church architecture. As usual, the apse with the primarily altar is in the east. On the outside, the unusual configuration of the apse is clearly visible. Its bifurcated form serves to reinforce support for the daring height of this remarkable monument. Easily accessible throughout the year, the Semyonkovo museum is admittedly an artificial environment. Yet the rescued and preserved structures that it displays are a source of wonder and delight—a reminder of craftsmanship that often seems little in evidence today.